Today we're delighted to announce the addition of a new section here on Bloom! called Sisters of the Faith. It's so important to hear how the Lord is working in our Sisters in Christ around the globe, because often He uses their lives to encourage, inspire, and strengthen us. 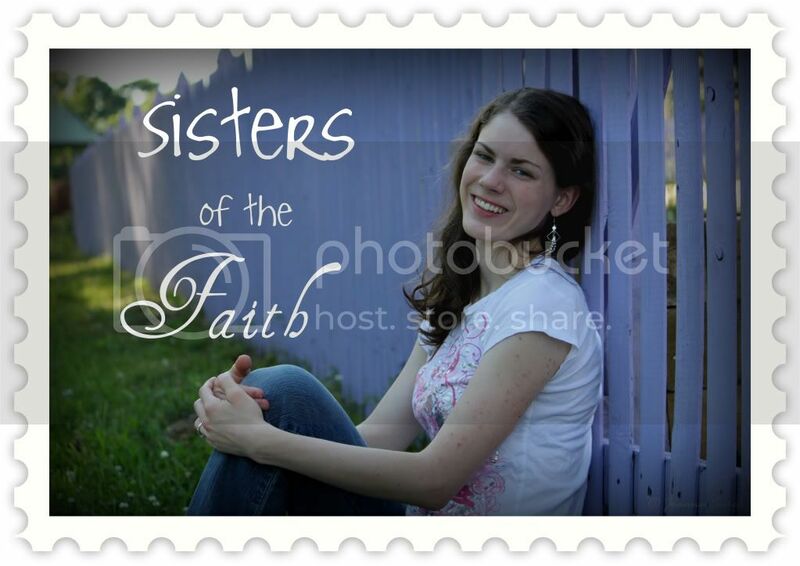 We hope and pray that Sisters of the Faith will give you a glimpse of God's love and show You His fingerprints of faithfulness all over countless lives of young women who follow Him. Our first interview is with Abbey, a young lady whose smile lights up a room and whose conversation is uplifting and God-pointing. Join us as we ask Abbey a few questions. Be prepared to be refreshed and encouraged in your walk with Jesus! I received Christ as my Savior when I was eight, shortly after my dad died. However, I didn't have much of a desire to know all I could about Him. I was just glad He had saved me from hell! The older I became, the less inward concern I had for His ways, no matter what I was saying on the outside. When I was about fourteen, I began to see that something needed to change in my walk with Him, but I wasn't sure how to do that or what to do. I realized later that there were bad habits and sins in my life that kept me from fellowship with Him, but I didn't catch that at the time. When I was fifteen, I attended a couple of weekend conferences that impacted me, and got me to start thinking, but unfortunately didn't really stick with me. Monday morning I fell back into my sinful, lazy patterns and forgot all I had just been told. Shortly before I turned seventeen, I knew I couldn't continue on in this pattern. I cried out to God for help, and totally surrendered my life to Him. The Lord began convicting me in a new way, working in my life and helping me to confess and forsake those sins that held me captive. As I began to get things made right, I was brought into fellowship with Him! It was then that I realized that I couldn't live with anything between me and my Savior. He brought me through difficult times, for sure, taking away some of my friends, my hopes and plans for the future. I even had a health scare. But He was so faithful - I began to desire Him and His refining fire, and started to trust Him with my life in ways that I never had before. A time for major growth took place near the end of last summer, when I found out about an opportunity to serve the Lord at a family camp in another state. My Heavenly Father showed me how to trust Him in so many ways before He sent me there - in providing the funds for the trip, in leaning on Him for protection since I traveled alone, and in waiting for His perfect timing with every little detail! He taught me much while I was there as well, and even provided some new friends for me - several godly, like-minded girls who have greatly encouraged me in Him. As He teaches me each little lesson, He fills me with a joy that could not come from anyone other than Jesus Christ Himself. He isn't done working on me, but when I realized my desperate need for Him and asked Him for His help, He began changing who I was into who He wanted me to become (Philippians 1:6). I am so grateful to the Lord for giving me victory over the deceptive and insubordinate lifestyle I was living! If you struggle with dishonesty or laziness, take it from someone who has been there - it's not worth it! The Lord tells us in Numbers 32:23 to "Be sure your sin will find you out." Whatever your sin is, it will indeed come to light in one way or another - no matter how you hide it or for how long. In my life, no human knew about what I was hiding, but the Lord did and He was the one who motivated me to make each area right with those that I had offended. Here at Bloom! we're passionate about living set-apart for Jesus. Tell us a bit about your journey to do just that. While I was at family camp, I came across an amazing book, Set Apart Femininty by Leslie Ludy. I literally felt tingles of excitement run through me as I read the back cover - this was exactly what I needed! It taught me so much about my Savior, and I highly recommend it, if you haven't discovered it already. I picked up many life-changing lessons. I learned how important it is to separate myself from the world so I can spend time delighting in His presence. I also realized that I need to be pouring out my life for others, becoming His servant to those around me. I've asked Him for practical ways to serve here at home, and He has been faithfully showing me ways to minister to my family and those placed in my path. My greatest delight is to spend time with my Lord, studying His Word and memorizing it. What is daily life like for you as you finish high school? How do you seek the Lord during this season of your life? Honestly, I don't feel very useful right now! Each day is so full of schoolwork, I don't have a lot of time for anything else. Yes, there are small, temporary acts of service I can do, such as babysitting for a Valentine's banquet, but they don't feel very important. Yet small things are important to God (Matthew 25:45)! I do know that I'm suppose to "bloom where I'm planted" and seek to serve the Lord where He has placed me now. A quote by Amy Carmichael has really encouraged me: "A wise master never wastes his servant's time." Isn't my Master wise? Don't I trust Him? I know He will lead me down His paths, and in His timing. My greatest desire is to be used by Him, but for now, His will for me is to finish up high school and stay right where I am. He has brought things to my attention in the past, where I can be used for Him, and I am confident that He will continue to do so. My life and time are not being wasted by Him if I am doing His will. Also, if I am faithful with the little things He entrusts me with now, doors could be opened to greater responsibilities in the future (Matthew 25:21). If there was one thing you could say to the girls of your generation, what would it be? Delight in the Lord! Pour out your heart and troubles before Him and let Him be your All in All. Start this habit now, and you won't be satisfied with anything less than Him. I'm sure you've heard this. I heard it all the time, but I've only been putting it into practice within the past year or so. I'm so amazed by what I've learned about Him and all He has taught me! Psalm 37:4 says "Delight yourself in the Lord, and He will give you the desires of your heart." However, don't "delight" in Him so that He will give you what you want. Seek Him because you want to know Him more and because He wants you to know Him more. I've discovered that my desires have changed to His desires (a greater desire to see the lost come to repentance and faith in Him, for example) as I seek Him. If there is something keeping you from Him, prayerfully consider what is holding you back and get rid of it! Hanging on to sin will only hurt you in the future, and spiritual growth comes when you forsake your sins. Don't surrender to your flesh in any way in your walk with Jesus. No matter how small, any gap can destroy your fellowship with the Lover of your soul if you don't do something to mend that gap. Some of my favorite verses that I've found about delighting in Him, and waiting on Him and His timing are: Job 5:8, Psalms 16:11, 39:7, 62:5, 62:8, 143:8 and Lamentations 3:24-26. Most importantly, be satisfied in Him alone. If you don't find your satisfaction in Him, you won't ever find it in anything or anyone else. I love this! Thank you so much for sharing from Abbey. What she's shared has encouraged me so much - it was what I needed today! I love this new article! Can't wait for more! Thanks for all your work! Abbey's article was so encourging. I loved seeing what God has done in her life and what He is doing even now.